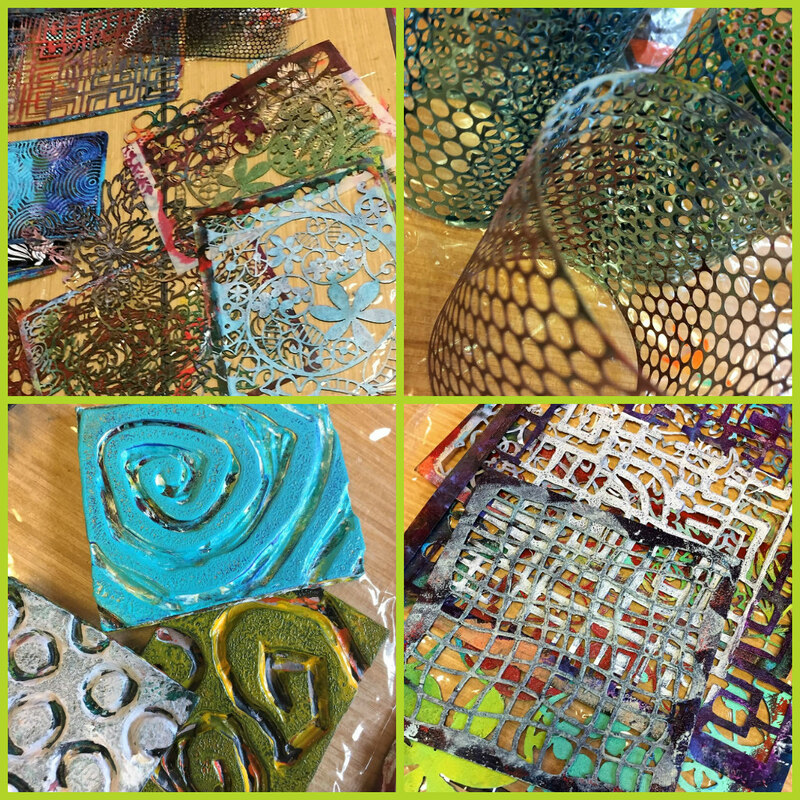 BLOG:: OOAK Artisan Showcase: It's All About the Gelli! Mono-printing is a technique which is similar to traditional printmaking. According to Wikipedia, Printmaking is the process of making artworks by printing, where an inked image is transferred from a plate to a printing surface, usually paper. Where monoprinting differs is that the design can only be made once, making each print unique. "Monoprinting without a Press!" is the slogan over at Gelli Arts ® . Traditional printing plates are costly, permanent and can be messy to use. 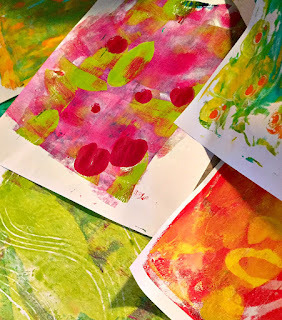 Gelli Arts ® products are not only easier to use but a tool that is affordable for crafters and artists alike. 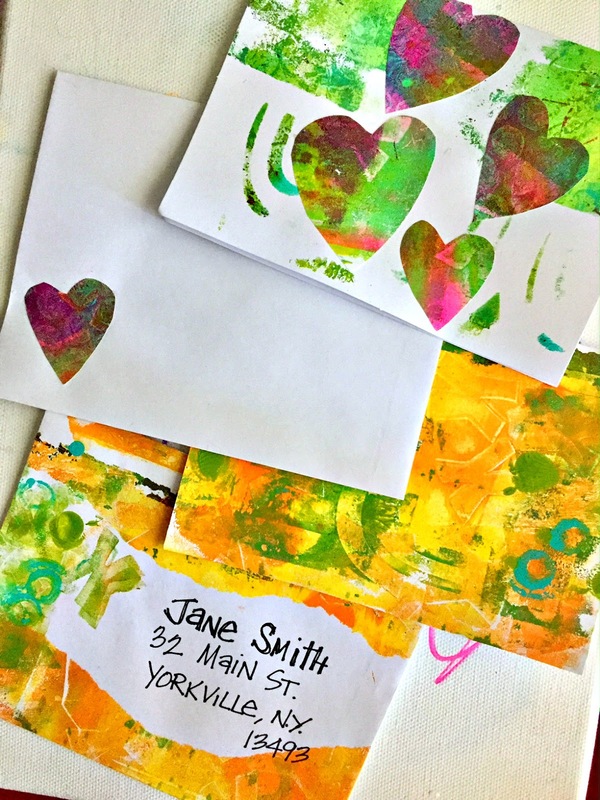 We have a special offer on select Gelli Arts ® products here at OOAK Artisan Showcase - email us at sales@ooakartisanshowcase.com for more info! I've had one for a couple of years now and I use it for all kinds of things, from simple things like creating my own stationary and stickers, to using it in my artwork. Being an mixed media artist I just love using my own "painted paper" in my artwork. Not only are my pieces guaranteed to be one-of-a-kind, but I am able to match my chosen color palette exactly. Painted paper is a term used by artist. It's pretty much what it sounds like, but it is so much more! Paper of all types (cardstock, copy paper, artist-grade paper, old magazines and newspaper, deli paper, handmade and other specialty paper) is painted using acrylic paint, markers, crayons and other mediums. Sometimes it's as simple as a brush load of paint, other times color is built up layer by layer. Along with the gelli plate and your choice medium, using materials such as stencils and mark making tools will make your painted papers that much more unique. You are limited only by your imagination. 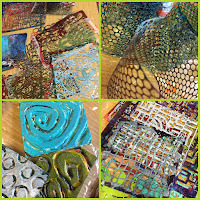 For some of the best techniques around check out those shared by Birgit Koopsen on the Gelli Arts ® Youtube channel. What else can you do with painted papers? Well I can't continue without mentioning one of my favorite artists, Elizabeth St. Hilaire. What this woman does with torn pieces of painted papers will blow you away! Instead of just layering the paper in backgrounds of the art, she uses them as the medium with which she "paints", as she has in the goat and the peacock pieces below. We were lucky enough to have recently hosted a workshop with Elizabeth. Hopefully we can get her back again! She travels all over the world teaching her technique. 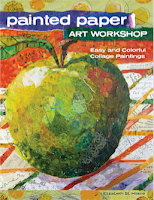 If you can't get to one of her many workshops be sure to look for her book, "Painted Paper Art Workshop: Easy and Colorful Collage Paintings" (available on Amazon). Also, in July 2018, OOAK Artisan Showcase will once again bring you Nathalie Kalbach and Birgit Koopsen. 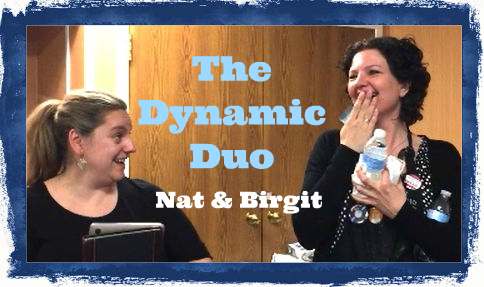 This dynamic duo will be returning to teach another 3-day color packed workshop. 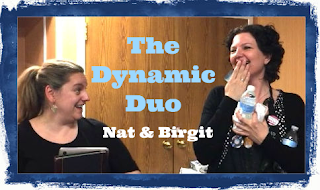 CLICK HERE to read about our past workshop. For more information on the 2018 workshop email us at July2018@ooakartisans.com . We will add you to our mailing list and make sure you hear details as plans develop! 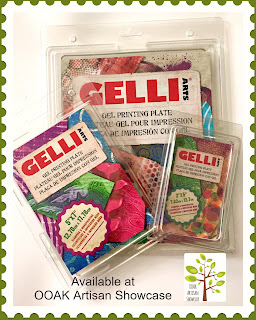 Gelli Arts ® has just added new items to their product line. NOW, in addition to their many sizes and shapes of gelli plates and tools, they are offering stencils, mini tool sets and even an official Gelli Arts ® apron! We know we already said it twice, but we don't want you missing out as this special offer is available ONLY to those who email us for details! E-Mail us at sales@ooakartisanshowcase.com for more info!